With the music portion of South By Southwest (SXSW) 2011 in full swing, it seems appropriate to examine some of the most talked-about music documentaries at the event, the first of which takes us to Stockton-on-Tees, a small market town in the North East of England. 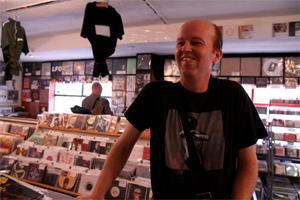 Jeanie Finlay’s charming documentary Sound It Out, which had its world premiere at SXSW, follows the staff and customers of the titular record shop, which is the last remaining independent music retailer in the Teeside area. Such shops have taken a beating in recent years, with the triple threat of online piracy, eBay and cost-cutting retail chains all conspiring to reduce consumer demand, and Sound It Out is one of the last of a dying breed. Finlay’s film, billed as something of a real-life version of High Fidelity, is effective in portraying the passion of the shop’s owner and his assistant, but where it really hits its stride is in focusing on the regular customers who commit to the shop with almost religious zeal. The doc follows these characters – all of whom bring a smile to the face – into their homes, where they discuss the importance of music in their lives and their passionate love for the Sound It Out record store. Among them are two metal-loving Goth teens, an assembly of young men who DJ from their garden shed, and a Status Quo obsessive who finds in the shop the inclusive environment that has been missing for most of his life. The film also effectively portrays the difficulties the recession has brought to the area, with many out of work and an increasing number of customers trying to sell music and goods to the store in a bid to raise cash. As should befit such a doc, an excellent soundtrack keeps pace. The story behind the documentary is just as interesting, with Finlay having used crowd-funding from some 260 online backers to raise the money to make the film, with each supporter earning a credit. Success stories of such ventures are still few and far between in the factual sector, so Finlay’s triumph is a welcome addition to a nascent canon which includes the likes of Franny Armstrong’s The Age Of Stupid.